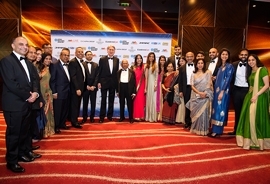 22nd March 2019, London, UK – British Asian entrepreneurs and wealth creators were celebrated and honoured tonight at the annual Asian Business Awards at London’s Westminster Park Plaza. Now in their 22nd year and hosted by the Asian Media Group, publishers of Eastern Eye, the awards recognise the contribution and achievements of outstanding business leaders in the UK. The Asian Business Awards saluted both Asian entrepreneurs and businesses, which created jobs and had a significant impact on the country’s economy. The awards ceremony also saw the launch of the 2019 Asian Rich List, a compilation of the 101 wealthiest Asians in Britain, highlighting exceptional entrepreneurial achievement over the past 12 months. The Asian Rich List is the definitive and most authoritative guide to Asian wealth in Britain and shines a light onthe substantial economic achievements of a community. It was a night of double triumph for the pioneering Hinduja family, who topped the Asian Rich List for the sixth consecutive year and also picked up the Philanthropy Award for their long-standing charitable endeavours with the Hinduja Foundation. The foundation, which was started in 1969 and celebrates its milestone 50th year this year, works in a wide range of areas such as education, healthcare, promotion of arts and culture, sports and social welfare. Haroon and Farouq Sheikh of CareTech, which runs a large number of established residential care homes in the UK, picked up the top award of the evening, the prestigious Asian Business of the Year award.It was a successful night for the care homes industry as Mala Agarwal, Managing Director of Athena Care Homes collected the Businesswoman of the Year award and CHD Living were the winners of the Care Home Operator of the Year Award. The galaevening was hosted by BBC Radio Five Live presenter NihalArthanayake and welcomed politicians, celebrities, influencers, entrepreneurs, business leaders and philanthropists to celebrate the diverse spectrum of Asian business and the invaluable contribution made to British economy and society. With a 50-year heritage, The Asian Media Group (AMG), publishes a stable of market leading magazines for the Asian community in the UK and USA. The company hosts a number of hugely successful events and award dinners affiliated with its magazines. AMG is Britain’s biggest Asian publishing house and its titles includes Eastern Eye newspaper, Garavi Gujarat newsweekly, Asian Trader, Pharmacy Business, Asian Hospitality, the Asian Rich List, the Asian Rich List Midlands and the GG2 Power List.